Viking Toys is a Swedish company founded in 1974. Viking Toys mission for more than 30 years has been to design, manufacture and sell the safest and highest quality toys possible. These cute Toys are brightly coloured, simple and most importantly child proof! 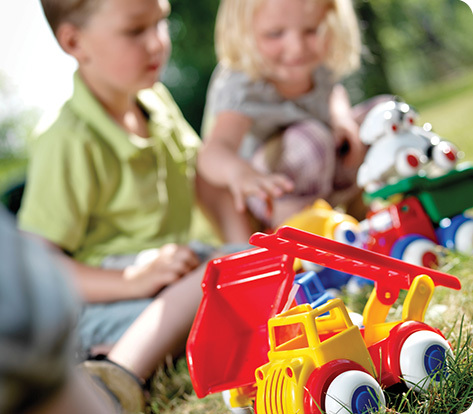 The plastic is completely safe and Viking Toys are made to withstand the roughest treatment both indoors and out. Mum's will be happy to know that Viking Toys are dishwasher safe and the soft rubber wheels are quiet and won't scratch wooden floors. Viking Toys is specialized in design and manufacturing of safe and high quality toys for children ages 1 and up. These principles and ideas for safety and quality have been the foundation of Viking Toys success and make them extremely popular with kids and parents alike. Our toys are safe for even the youngest child. made of soft, virgin plastic. construction make our toys extremely durable. Viking toys are of a classic, timeless design. them from damaging floors and furniture.